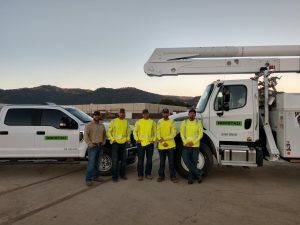 On September 22, an IBEW 1245 line crew from Rockstad Power was wrapping up work after a routine pole change-out when their day took an unexpected turn. As the crew was heading back to the Ukiah yard from Lakeport, they spotted a small brush fire, which apparently started when a pickup truck had lost its drive shaft. IBEW Journeyman Linemen Edwin Peterson and Anthony Huck were driving by when Peterson first noticed the small flames, about the size of a campfire. They immediately pulled over to the side of the road and began unloading water cans, shovels and rakes from their truck. Crew Foreman Trey Woodruff and Groundman Tyler Noel arrived less than a minute later. As Peterson and Huck headed toward the blaze with water cans, Woodruff and Noel decided to head around the fire the other way to beat it back and warn residents of the danger. They estimated the fire had grown to 100 square feet in less than a minute. Conditions were ripe for disaster. The crew knew they could not stop the blaze, but they could try to slow it down while they waited for firefighters to arrive. And that’s just what they did. Working together, the crew was able to gain control of the fire, keeping it away from the waist-high brush that the Mendocino Complex Fire had somehow missed when it ravaged the area less than two months earlier. Through their efforts, six houses to the north and four houses to the southwest were kept out of danger until CALFIRE arrived on the scene with 50 firefighters, truck engines and bombers to drop fire retardant on the blaze. “Once the firefighters got there, we did the right thing and got our trucks out of the way. We didn’t want to slow them down,” said Woodruff. All told, the fire consumed one abandoned building, approximately 50 acres of land, and a couple of vehicles. One relieved resident said the fire came within 75 feet of his house, and another thanked the crew for saving his grandmother’s home. The crew had received training on how to react in a fire situation in case they encounter one on the job, so they were fully prepared and knew exactly what to do. Because they work in remote areas, they are equipped with basic firefighting equipment on their trucks in case they happen to be the first on the scene, like they were that day. Woodruff and his crew had been through several California wildfires and witnessed their devastation firsthand. He recalled working in the areas that had been decimated by fires, in order to make them safe and restore power, and the emotional experience they had interacting with those residents who had lost everything. “We’re here to do whatever PG&E needs us to do– and whatever we can — to help the community,” he said. That day, the crew proved that IBEW members are always ready and willing to do whatever it takes to help out and protect the community – and they’re proud to do it.